Project 365: Week 11 – Austin! March 12, 2009: Most of this day was spent traveling. Our house to SFO. Flight to Austin. Rental car to hotel. By the time we were checked into the hotel and settled into our room a little it was 9:00 pm and we were all starving. We asked for a BBQ recommendation at the front desk and they pointed us to the Green Mesquite. 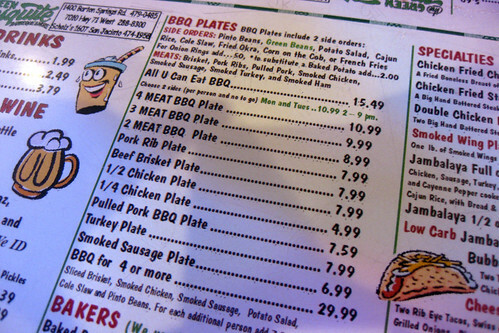 Yuuuuuuummmmm, BBQ! It was so good, we ended up eating there again on our last night in town. March 13, 2009: This day was rainy and cold — in the 40’s! Cripes! Zach took off for the convention center and the kids and I headed over to the Austin Children’s Museum for the afternoon. Wyatt had a particularly great time playing in the grocery store and restaurant play areas. See that white tube in the upper left hand corner? 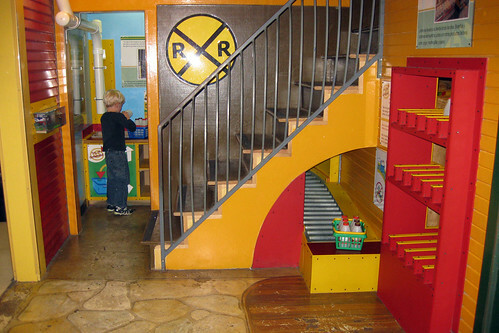 That was a pneumatic tube that sucked milk bottles from one part of the play area to where Wyatt is standing. They popped out of the tube and dropped into a bin below and then the kids could load them up in baskets and put them on a conveyor belt to restock the shelves (on the right side of the photo). March 14, 2009: Saturday was less rainy, but still cold. I wasn’t thrilled to be outside, but I knew there was more rain forecasted for the week so we chose an outdoor activity over an indoor one. We went to the Austin Nature and Science Center which was great! They had rescued animals to look at, a nice indoor area with microscopes and a huge sand pit full of dinosaur “fossils” for kids to dig up. 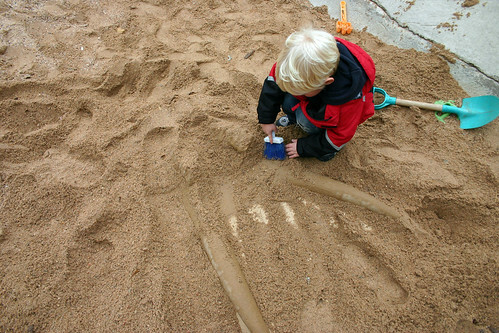 Wyatt started out burying fossils, then changed his mind and decided to dig. Afterwards, when we were looking at the animals, he started playing with another little boy. I struck up a conversation with the parents and after chatting for 15 minutes discovered that their infant son was also named August. Weird. March 15, 2009: Rainy and cold again so we went to the Bob Bullock Texas State History Museum. Not the best choice for a four year old, but I thought the museum was fun. Wyatt did enjoy the movie we saw there though. 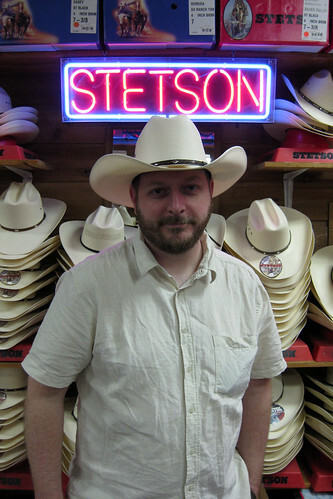 It was about the history of Texas (surprise! ), but it was in one of those theaters where the seats can move and they do other effects inside the theater. Wyatt was very impressed that it rained inside and that if felt like a rattle snake bit our booties, but the main thing he took away from the museum were the stories of oil strikes and gushers. 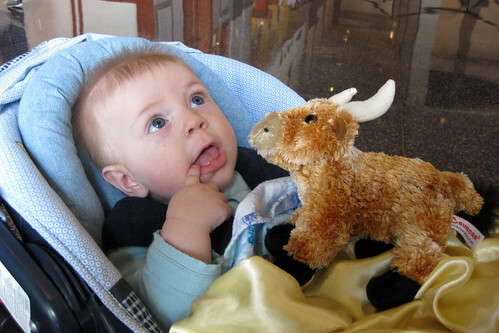 The main thing Augie took away was a stuffed longhorn bull. 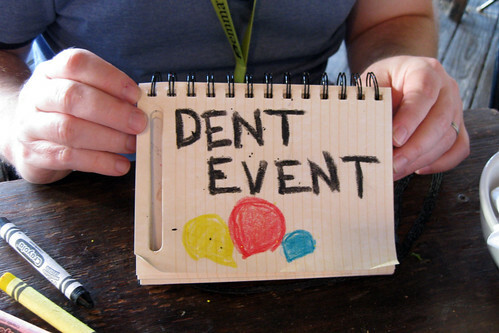 March 16, 2009: This was the day the weather turned around. The temperature rose 35 degrees over night and we were treated to a sparkling, warm Texas day. The boys and I headed over to Zilker Park and played on the mammoth play structure there. Later in the afternoon we met up with Zach at the convention center and played in a giant pile of Legos while he attended some more sessions. Later, all four of us went to Stubb’s BBQ for dinner. Yum! (Though I thought the less famous Green Mesquite was better…) Zach toodled over to a nearby bar for the Dent Event he was hosting and I took the boys back to the hotel to watch Bolt on pay per view. March 17, 2009: Zach got to spend a little time with us on our last day in Austin because SXSW was winding down. We met up with him in the afternoon and headed to the S. Congress area to do some shopping. Allen’s Boots was a highlight. Zach and Wyatt both got cowboy hats and Augie got some baby cowboy boots (so cute!). We also ate cupcakes sold out of an airstream trailor. 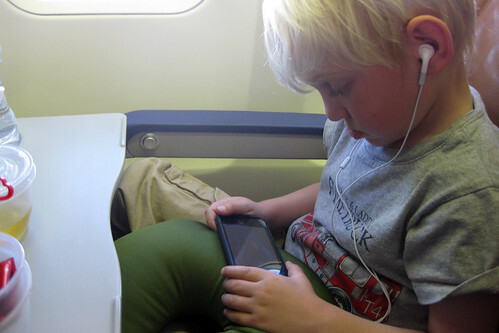 March 18, 2009: The iPhone has made flying with a 4 year oldso much more pleasant! Wyatt is actually a pretty patient flyer as it is. He usually sleeps for part of the flight and watches a movie on the phone for the rest. It makes it much easier to handle having Augie on our laps.